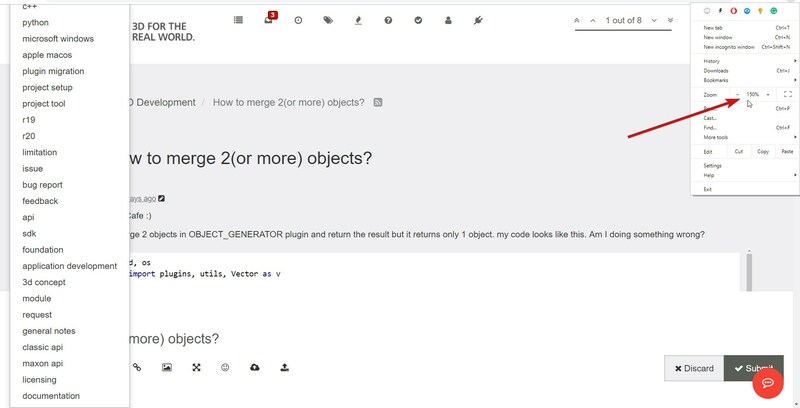 I need to merge 2 objects in OBJECT_GENERATOR plugin and return the result but it returns only 1 object. my code looks like this. Am I doing something wrong? Hi @merkvilson; MCOMAND_JOIN have changed in R18, now objects have to be under the same hierarchy. See Behaviour of MCOMMAND_JOIN different in R18 or [Python] SendModelingCommand(). btw. is it possible to sort the search results by date? I was getting 8 years old posts when looking for this topic. Then on this page, you can define more option to search, and you can decide which kind of sorting you prefer. Finally please do not forget to mark your topic as solved. See Q&A Functionality . I was looking for "Solved" option in tags section but could not find it. Finally, I figured this out. thanks for pointing out this issue. We'll see if can get a fix for that (not all tags visible, if zooming in with browser). In the end Maxime wasn't referring to tags at all. Instead he was talking about the Q&A Function we have in this forum. I took the freedom to mark this thread as solved (see this shiny green stamp next to the headline ).